In this sixth and final volume in the Foundation of Buddhist Thought series, Geshe Tashi Tsering brings his familiar, helpful approach to the esoteric practices of Buddhist tantra. Anticipating the many questions Westerners have upon first encountering tantra's colorful imagery and veiled language, Tantra uses straight talk to explain deities, initiations, mandalas, and the body's subtle physiology of channels and chakras. Tantric Buddhism provides a quick avenue to buddhahood by means of dissolving the body's wind energies into the central channel at the heart, mimicking the transformations of consciousness that occur at the time of death. Guiding readers systematically from tantra's generation stage through to the full enlightenment of the completion stage, Geshe Tashi Tsering even unpacks a simple compassion practice composed by the Dalai Lama, using it to illustrate the building blocks common to all such visualization techniques. Tantra is a fitting conclusion to this accessible and practical series. 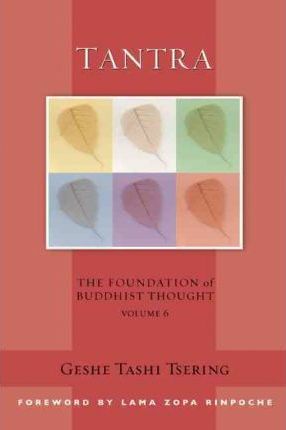 In this sixth and final volume in the "Foundation of Buddhist Thought" series, Geshe Tashi Tsering brings his familiar, helpful approach to the esoteric practices of Buddhist tantra. Anticipating the many questions Westerners have upon first encountering tantra's colorful imagery and veiled language, "Tantra" uses straight talk to explain deities, initiations, mandalas, and the body's subtle physiology of channels and chakras. Tantric Buddhism provides a quick avenue to buddhahood by means of dissolving the body's wind energies into the central channel at the heart, mimicking the transformations of consciousness that occur at the time of death. Guiding readers systematically from tantra's generation stage through to the full enlightenment of the completion stage, Geshe Tashi Tsering even unpacks a simple compassion practice composed by the Dalai Lama, using it to illustrate the building blocks common to all such visualization techniques. "Tantra" is a fitting conclusion to this accessible and practical series. "Geshe Tashi's systematic approach to Buddhist thought allows readers to gradually but surely enhance their knowledge of Buddhism without feeling overwhelmed." --"Eastern Horizon"
Geshe Tashi Tsering was born in Tibet in 1958 and trained at Sera Monastery in India. Since 1994, he has been the guiding teacher at Jamyang Buddhist Centre in London, and he also teaches at other Buddhist centers worldwide.